The world knows a good number of spectacular train journeys. And everyone has their own favourite. 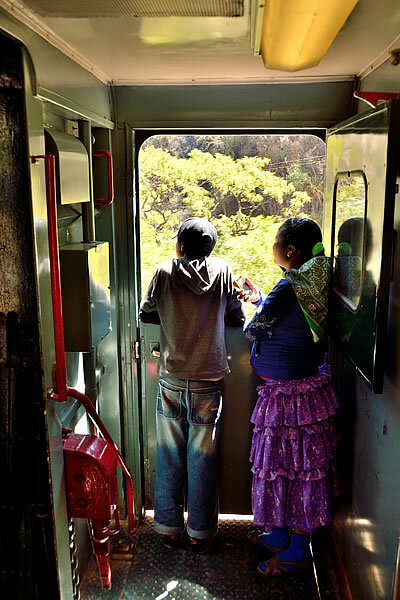 You would not expect it, but Mexico also has its own classical train ride: the Copper Canyon Train Journey. 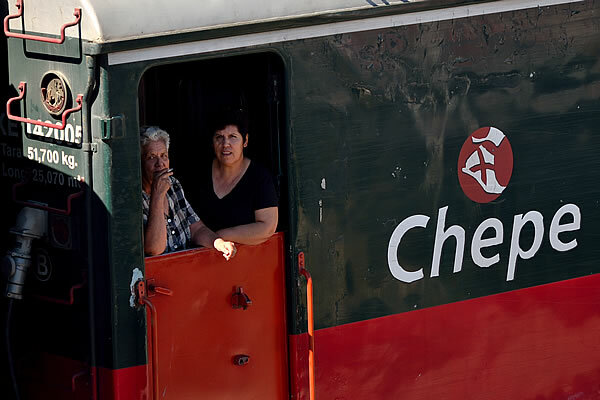 The "Ferrocarril Chihuahua al Pacífico", also known as El Chepe, connects the lowland town of Los Mochis with the highland city of Chihuahua. 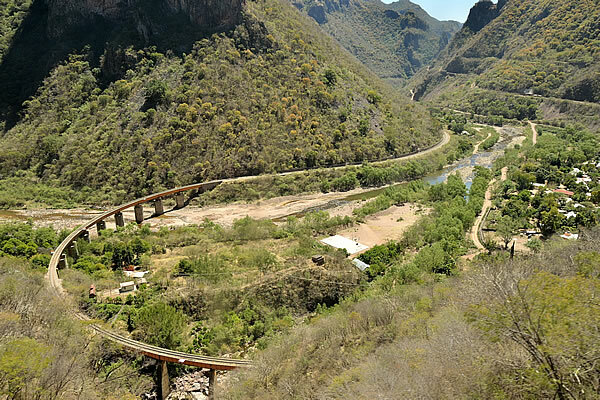 The total length of the train ride is 673 km and the track runs straight through the Copper Canyon (Barrancas del Cobre), passing 86 tunnels and 37 bridges on the way. The railway reaches a maximum altitude of 2400 meters above sea level, and the engineers had to use hairpins and even a full loop (called El Lasso), to allow the train to gain height. The construction of the track started around 1900 and it took until 1961 before the line opened. 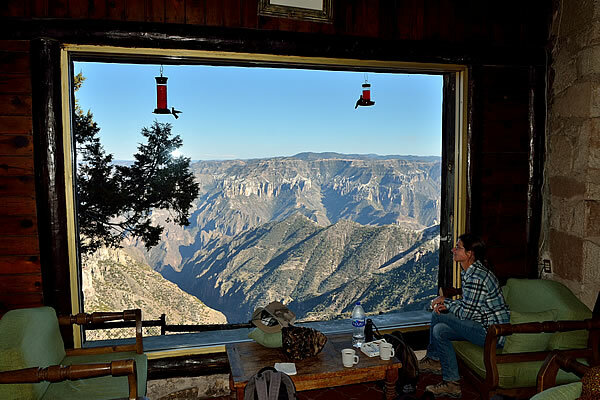 The Copper Canyon Train trip is considered to be one of the most spectacular train journeys on the American continent. 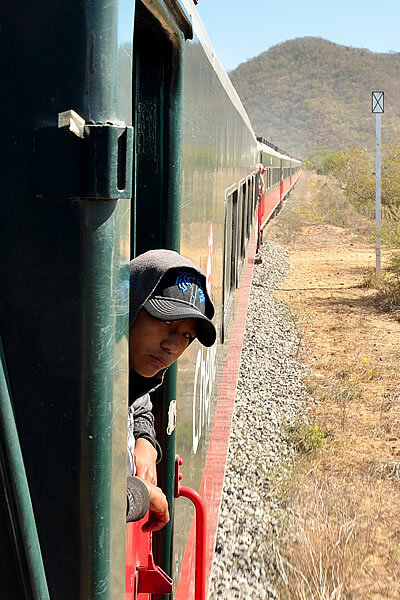 We started our train journey in the small town of El Fuerte, two hours by train or bus from Los Mochis. We decided to do that because the first two hours of the train ride isn’t very interesting because it passes through a flat and relatively boring farmland. After El Fuerte, the train journey becomes interesting. The landscape changes from an agricultural farmland into an arid area of dry forest, and soon afterwards the track starts gaining altitude. The train has two classes, the first class and the economy class. The first class is definitely more luxurious, but for the vast majority of travellers, the economy is more than good enough. The first class is mainly used by foreign tour groups, while the economy class is largely used by the ordinary Mexicans, including the Tarahumara Indians, who still live in this area. In our opinion, the economy class is definitely the preferred class, not only because of the large price difference (almost half), but also because of the fact that you are among the Mexicans. Outside the high season (Christmas, Easter and the holiday months of July and August), you can take the train without making a reservation. You just go to the train station and buy a ticket from the conductor on board. If you are allowed to board the train, then you have a chair, because the conductor will not let you board if there aren’t seats available. Or in other words, there are no standing places. The train runs once a day in both directions and the entire journey takes 16 hours. The trains starts at 06.00 in the morning, both in Los Mochis and Chihuahua. The first class has a restaurant, while the economy class has just a cafeteria. The choice in the cafeteria is limited but adequate, and everything costs 20 pesos (1 Euro / 1.08 USD), whether it's a cola, coffee, a bag of potato chips or a burrito. There are 16 stations along the route and at most stations the train stops just a few minutes to pick up and drop passengers. Only at the Divisadero station the train stops for 20 minutes, to give passengers the opportunity to get out of the train and walk to the nearby viewpoint to enjoy the breathtaking views of the Copper Canyon. 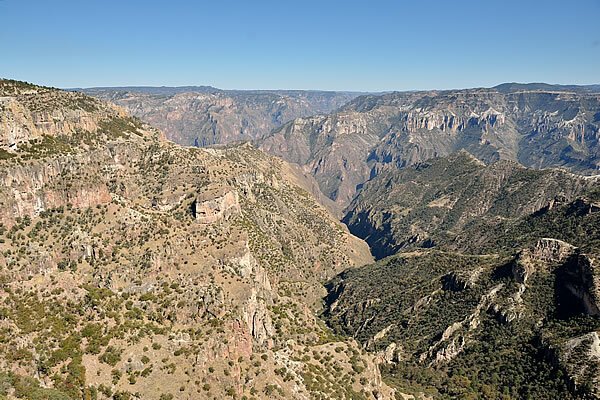 The Copper Canyon is the largest canyon system in the world. It is larger and deeper than the Grand Canyon, although no individual canyon of the Copper Canyon is larger than the Grand Canyon. The added length of the copper canyons exceeds 1,500 kilometres, and at the deepest point, the canyons are more than 1800 meters deep. The overall system covers an area of 30,000 km2. The entire area is a national park. Most villages along the train track have accommodation available for travellers in the form of rooms or cabanas. It is possible to make multiple stops. Just make sure that you have reserved tickets for the onward journey during the high seasons, otherwise you might be stuck in one of the villages. Outside the season you can hop on the train without a reservation. We made a total of three stops. We stayed two days in El Fuerte, two days in Posada Barrancas, and two days in Creel. 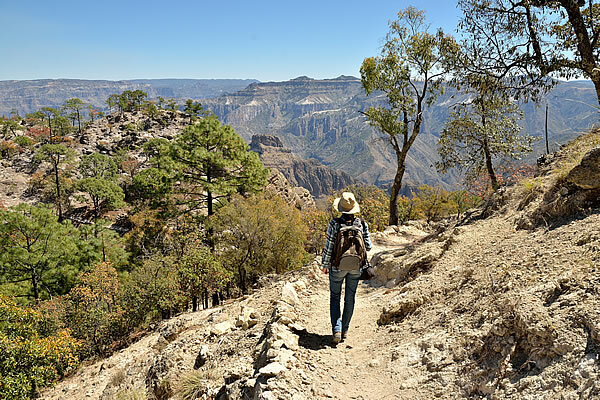 Especially a stopover of a few days at Posada Barrancas is recommended because you do not only have good views on the canyon from here, but you can also make fantastic hikes into the canyon. Just outside Posada Barrancas lies the Parque Aventura Barrancas del Cobre (http://www.parquebarrancas.com/), which offers zip line tours into the canyon and they operate a modern Austrian made cable car system which takes you three kilometres into the canyon. Also the stopover in Creel was worthwhile. The town of about 6,000 inhabitants is the tourist heart of the Copper Canyon, with a wide range of hotels and restaurants. It is a very touristy town, especially for Mexican tourists, but the atmosphere is good. Also around Creel you can make beautiful hikes. If you are not really a walker, you can hire a bicycle or a scooter. Especially the Valley of the Monks (Valle de los Monjes) and the Valley of the Frog (Valle de las Ranas) are popular destinations because of their rock formations. Mexicans sometimes compare this rock formations with those in Cappadocia in Turkey, but that comparison is in our opinion a little too ambitious. The valleys around Creel are still predominantly inhabited by the Tarahumara Indians. The Tarahumara are among the poorest residents of Mexico. 64% of the adult Tarahumara has never been to school, and 57% are illiterate. Healthcare is absent or of poor quality, in part because of indifference of the government, and in part because of the distrust of the Tarahumara. Most Tarahumara live of the produce of their own fields or cattle breeding, but since the construction of the railway, also the selling of souvenirs to tourists has become a source of income. This is not a painting. This is the view from the bar of the Hotel Divisadero Barrancas.